Update: April 11, 2:11 p.m. The plan to construct a new stadium for FC Cincinnati is contingent on a number of potential obstacles. The first was overcome on Tuesday. The board of Cincinnati Public Schools agreed to demolish Stargel Stadium. With it, they agreed upon a location (a currently vacant lot across the street from Taft High School) for a new $10 million high school athletic complex to be built by FC Cincinnati. The building of a new stadium is now contingent on just two factors. First, the Cincinnati City Council has to approve a $34 million funding package, which is expected to be voted upon by April 18. As it stands right now, the members of the council who have gone public with their thoughts seem to be somewhat split on the issue, so this vote could easily make or break this plan. Second, the stadium will not be built unless FC Cincinnati is granted MLS expansion. This is where things get a little fishy. Some city council members might be reluctant to vote on the stadium funding package until they know that MLS expansion is guaranteed, but MLS expansion probably won’t be guaranteed until plans for the stadium are set in stone. This issue is going to have to give in one direction or the other, and it’ll be interesting to see how the vote plays out. With the pieces seemingly falling into place, FC Cincinnati continues its quest of making a convincing argument about why it should be the next MLS team. Initial Story: April 10, 6:25 p.m. In December, Nashville, Tennessee was approved as the next city to host an MLS expansion team. Three cities (Cincinnati, Detroit, and Sacramento, California) are in contention to be granted yet another expansion team. Cincinnati was already a strong candidate for the newest MLS team, and their case has recently gotten even more convincing. On Friday, Cincinnati City Council members P.G. Sittenfeld and David Mann revealed a plan to build a brand new stadium to host current USL and potential future MLS team FC Cincinnati. FC Cincinnati currently plays its home games at Nippert Stadium, also home to the University of Cincinnati Bearcats. With a capacity of 40,000, Nippert stadium would be the eighth-largest in Major League Soccer should FC Cincinnati make the transition. Other than some minor scheduling issues due to a number of different teams sharing the field, Nippert Stadium has been a very accommodating home for FC Cincinnati. 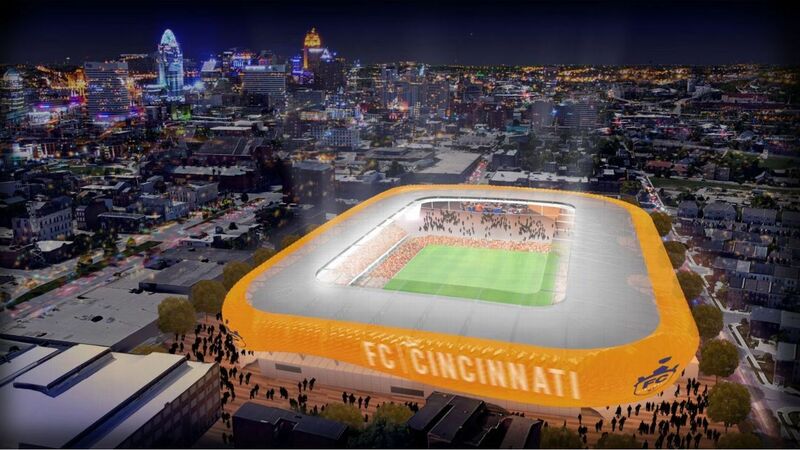 If FC Cincinnati were to move to MLS, would a new stadium be 100 percent necessary? Probably not. But the idea of it is attractive to everyone: from fans to city residents to the MLS expansion committee. The hypothetical plan benefits not just the soccer club, but the city as well from a marketing standpoint. According to cincinnati.com, the proposed plan sees FC Cincinnati building a $200 million dollar stadium on Central Parkway in the West End neighborhood. The West End was once a low-income area, but for the past couple decades developments have turned the neighborhood into mixed-income. That’s where this new stadium plan comes into play. Stargel Stadium, the current stadium used by a number of Cincinnati public schools, would be torn down, and the new FC Cincinnati stadium would be built on Stargel Stadium’s former grounds. FC Cincinnati would build a new ten-million-dollar high school stadium at a different location. In addition to providing the school district with a new stadium, FC Cincinnati would pay $25 million in property taxes to the school district, as well as spending $100,000 per year on improving the neighborhood. The deal is far from done, however. A $33.8 million dollar budget plan has to be approved by the Cincinnati City Council; a vote will take place Tuesday, Mar 10. The Cincinnati Public School board has to approve the demolition of Stargel Stadium and agree on a location for a new stadium. The Greater Cincinnati Redevelopment Authority also has to agree to help fund the project, an organization that has not been impressed with the antics of choosing a stadium location. This is risky business FC Cincinnati has gotten itself into. A new stadium doesn’t seem completely necessary, but if this proposed deal comes to fruition, it would be huge for Cincinnati’s bid for MLS expansion. If it doesn’t pan out, however, the city of Cincinnati might have missed its opportunity for MLS expansion in the near future.